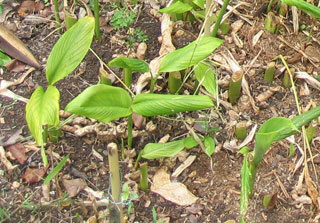 Proto Malayo-Polynesian *renga, Curcuma longa (Zingiberaceae), Turmeric, especially the powdered root. Phormium tenax - wharanui, harakeke in background. Samoan: Lega (Prepared root of C. longa). Watch this space! This page is still under construction. However, it contains the essential linguistic and botanical information, along with some commentary. Additional text and possibly some more pictures will be added later when time permits. Looking at the rengarenga, it is not hard to see why it would have been a good candidate to receive the name which had been bestowed in other parts of Polynesia on the plant from which turmeric was obtained. Both are small, attractive herbs with fleshy stems and rhizomes or tubers respectively which had medicinal and culinary uses. They thus have a kind of family resemblance, although they are not especially closely related botanically -- the tropical renga is a member of the ginger family (Zingiberaceae) while the rengarenga is almost a lily. Until quite recently the genus Arthropodium was placed in the lily family (Liliaceae), but a few years ago botanists were divided as to its most appropriate classification - some place it in a family known as Laxmanniaceae, while others place the members of this proposed genus in a larger family known as Antheriaceae. It now appears to have been transferred to the asparagus family, Asparagaceae, which is where we can leave it for now. The rengarenga stems grow much closer together than those of the more individualistic tropical renga (illustrated by the inset of plants in the Limahuli National Botanical Garden, Kauai, Hawai'i). Me tupu i a wiwi, i a wawa, turia i te wera, piri ki te rito o te rengarenga, waiho me whakapakari ki te hua o te kawariki"
Mead and Groves interpret kawariki in this context as the ranunculus, "the seeds of which mature before release". This may be so, but I think that the kawariki referred to is Coprosma grandifolia, which has a profusion of seed-bearing berries with both reproductive and nutritious functions! Māku anō tōku nei whare e hanga: ko ngā poupou o roto he māhoe, he patatē ko te tahuhu he hīnau. Me whakatupu ki te hua o te rengarenga, me whakapakari ki te hua o te kawariki. I myself shall build my house, the ridge-pole will be of hīnau and the supporting posts of māhoe and patatē. [My people] will be raised on rengarenga and nurtured on the fruit of the kawariki. The māhoe (Melycitus ramiflorus), patatē (Schleffera digitata), and hīnau (Elaeocarpus dentatus) were trees that would be used for building only the most temporary emergency shelter, and the fruit of the kawariki (Coprosma) would normally be emergency rations rather than a staple food. The baked roots of the rengarenga however are quite palatable, but it had something of the status of a sacred plant and it was eaten as a special treat rather than as a normal part of the diet. Tawhiao's saying contrasts the nourishing function of the rengarenga with that of the kawariki, a food promoting resilience and survival when things were not going well. The rengarenga was probably cultivated, whereas the kawariki was a wild food. The bases of the leaves of the rengarenga, and possibly also the cooked tubers, were beaten and the pulp used as a poultice for ulcers. 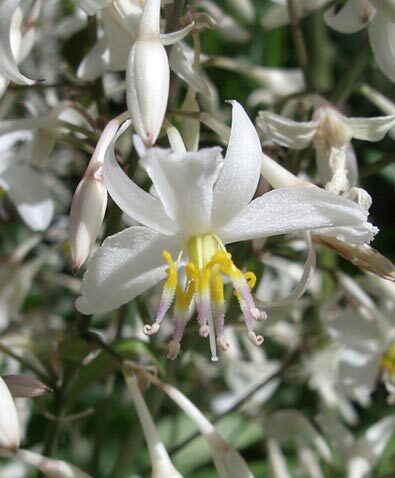 This role as a supplementary food especially in times of want may explain why the kōkihi (Tetragonia spp.) are also sometimes referred to as rengarenga -- that is about the limit of their resemblance! The rengarenga (Arthropodium) was also admired for the beauty of its flowers, and the only mention of rengarenga in Ngā Mōteatea is a poignant likening of the death of a warrior to the plucking of a rengarenga flower. Ki te hua o te rengarenga. Like the flower of the rengarenga. 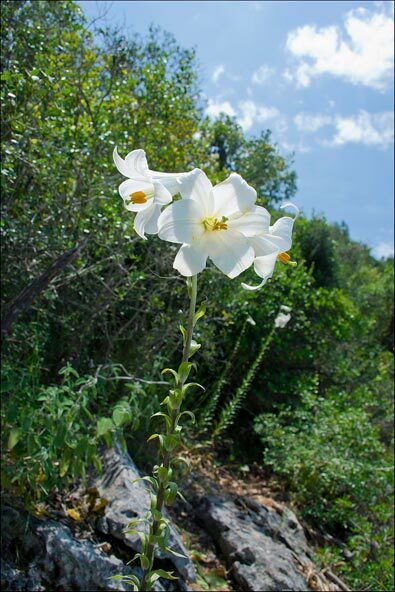 References to "lilies" in the English versions of the Old Testament are translations of the Hebrew word shushan, which some scholars regard as a generic term probably including water lilies and tulips; Michael Zohary however is sure that it referred specifically to the Madonna lily, Lilium candidum. 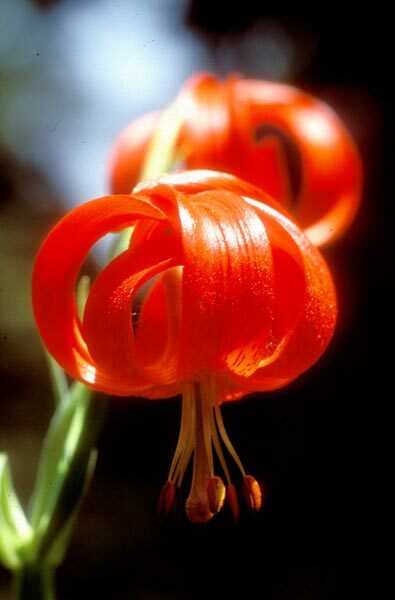 In the New Testament, the same English word is used for the Greek krinia, probably Lilium chalcedonium, the "red turkscap". In Te Paipera Tapu the Hebrew and Greek terms respectively are translated by rengarenga. 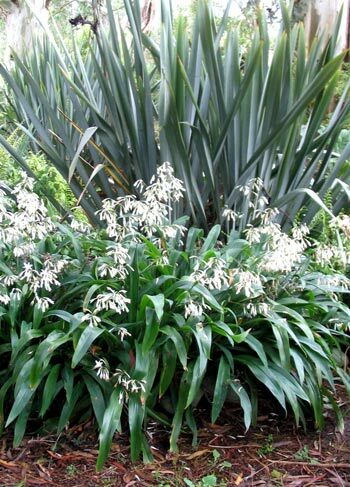 References and further reading: There is an excellent article by the late Graham Harris, "The significance of rengarenga Arthropodium cirratum to Maori" available on the Royal NZ Institute of Horticulture's website (it was originally published in the Journal of the RNZIH, Vol. 1, No 2, June 1996, pp. 19-21). There is also a brief article about Arthropodium cirratum with a series of excellent photographs, some at high magnification, of the flowers and other features of the plant, on the University of Auckland's Biological Sciences website . More information about the plant and its uses will be found in Murdoch Riley's Herbal, and other books on New Zealand plants listed in the bibliography. Photographs: The photograph of the rengarenga in flower is taken from the "Moosey's Country Garden" website; the closeup of the rengarenga flower is by Jesse Bythell of the NZ Plant Conservation Network. The two photographs below are from the Wikipedia Commons collection: that of Lilium chalcedonicum is by Ernst Gügel - Self-photographed, (c) CC BY-SA 3.0, https://commons.wikimedia.org/w/index.php?curid=1146055; the picture of Lilium candidum was taken by Zachi Evenor - CC BY 2.0, https://commons.wikimedia.org/w/index.php?curid=40403586. The photograph of the lena (turmeric) plants is by RB, Te Māra Reo.